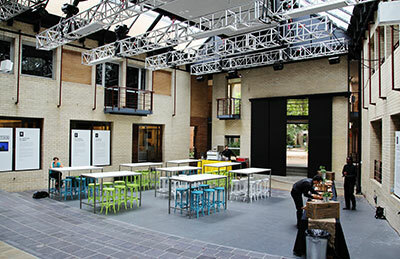 This versatile space was refurbished in 2011 to provide a covered, outdoor theatre equipped with truss, draping and heaters. When not in theatre mode, the Atrium provides a unique setting for cocktail parties and catered break-out sessions year-round. A specially designed system of blinds and draping provides superior weather-proofing and allows the space to be blacked-out for audio visual presentations. The Atrium and adjacent courtyards are fully licensed.